As my more eloquent friends wax you-know on the 40th Anniversary of Dungeons & Dragons, I decided to keep it simple. But first, a brief reminiscence. My classmate Jeff and his older brother Mike came to my house and taught me to play D&D around 1977. They’d learned the game from the little pamphlets, but my first copy was the basic set, which my parents bought me for Christmas. I ran “In Search of the Unknown” and soon graduated to the Advanced Dungeons & Dragons hardcovers, which I studied like I’d studied no textbook. Soon I wasn’t content only to play but had to be the Dungeon Master. A buddy introduced me to Dragon magazine and miniatures at the tiny local hobby shop. My fate was sealed. My pals and I played most weekends. By the later years of high school, our groups always included at least one female player, as they did in college, so it took me some adjusting to see D&D as a “boy’s club,” when I ran into that assumption only after our early groups defied it. My favorite period of playing D&D was probably in college, when my friends agreed to take turns as DM. We divvied up the Forgotten Realms. When your turn came around, your character went home, or to wizard school or the thieves’ guild or whatever, while the others, including the previous DM’s character, took on the next campaign. Perversely, I played much less D&D after joining TSR as an editor. I made up for it by playing lots of other games, often in playtests for development or reviews, or at conventions. I began playing D&D regularly again during the 3rd Edition playtests at Wizards of the Coast, drifted away again, played a while after 4e, drifted, and returned with Pathfinder. These days I seldom find the time to play or run a game, but that’s largely because I’m busy writing stories based in worlds inspired by D&D. When did you start playing D&D (or another roleplaying game), and how has it affected your life? My friend Kurt’s older brother Carl showed us his red box Basic Set around 1980. The two of us devoured the thing and immediately become obsessed. 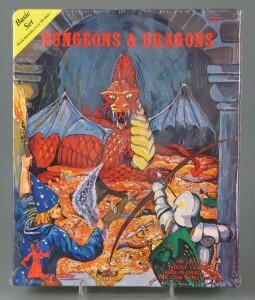 About the time all of my friends stopped playing I was so obsessed that I started writing my own materials; when Dungeon magazine came out I became obsessed with getting an adventure published. Before I quit, I ended up having 5 pieces on Dungeon and 5 in Dragon. I have to say the game had a dramatic impact on my life, giving me a vehicle for imaginative play and teaching me to love the flowery fantasy trappings that similarly grabbed the guys who created the game. While I don’t play D&D any more, it still has a huge impact on my life.